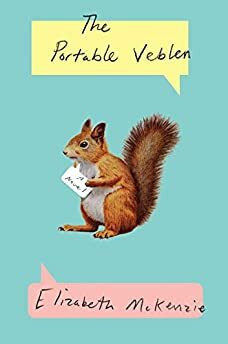 Largehearted Boy: Book Notes - Elizabeth Mckenzie "The Portable Veblen"
Book Notes - Elizabeth Mckenzie "The Portable Veblen"
Elizabeth Mckenzie's wildly entertaining novel The Portable Veblen is as wonderfully weird as it is thought-provoking. "A wild ride that you will not want to miss… rambunctious and sober, hilarious and morbid, [with] strong echoes of Joseph Heller and Kurt Vonnegut…This unforgettable novel offers a heartfelt and sincere investigation into the paradoxical nature of love, familial as well as romantic." To put together a playlist that relates to The Portable Veblen, all I had to do was look through the book, where significant songs are mentioned and even sung throughout. One in particular feels like the true anthem of the novel, Jefferson Airplane's "We Can Be Together." I'd play it loudly while driving around in my car whenever I needed to get away from my desk and reenergize, and for awhile, even considered titling the novel after it. Veblen listens to this opera while cleaning up the shack she eventually moves into in Palo Alto. She is entertaining romantic, bohemian dreams about her future here, listening to these impoverished artists break up their furniture to keep warm. This song will always remind of an awkward exercise routine we had to do in our 9th grade PE class (meaning that I now regard it with great affection). "I got fury in my soul, fury's gonna take me to the glory goal..." It comes into the story when we're in the consciousness of the injured veteran Warren Smith, as his wife plays a recording of their daughter's glee club. These days, everything is striking him as painfully grotesque, and this song is no exception. Perfect for a drive down Highway 101. Veblen's the kind of person who does some of her best thinking on long excursions. And the orchestral build up in Bolero bolsters her as she prepares to deal with her father who's in a mental hospital, and can't tell any story without adding: "He was never the same again" or "They were never the same again" or "She was never the same again." And spot some hollow ancient eyes…"
Later in the motel room, more disinhibited by another bottle of Pacifico, and continuing through her John Prine repertoire, Veblen may be obliquely expressing disappointment with the unsuitably fancy ring Paul has given her. "Ain't it funny how an old broken bottle, looks just like a diamond ring." Maybe she'd rather have an old broken bottle. This is the last song she sings out before the occupants of the adjoining room bang on the walls. "Come on all you people standing around…"
A song that feels so romantic until you realize it's about people melting in a nuclear attack—the essence of falling in young, doomed love, and which pops up in a flashback to Paul's tenth grade great love Millie Cuthbertson. "There's nothing you and I won't do…"
Paul's parents love The Dead, but Paul detests them. This song is playing when Paul makes a disturbing discovery out in his dad's forge and will ever after remind him "there's something nasty in the woodshed." This is truly a song one is likely to belt out unpremeditated after meeting someone special, and that's what Veblen does after spending meaningful time with her new animal friend. Veblen reflects on how she's unable to run across grass without pretending she's Julie Andrews singing The Sound of Music, and wonders why she can't just be herself when she runs across grass. Paul's refined appreciation for the finale of this overly familiar concerto spawns a realization in Veblen: that Paul has unplumbed depths she has yet to discover. Anthem reprise. "Tear down the walls, motherfuckers."